Clean your home naturally with these tips, tricks and recipes for using natural cleaners at home. As sunny spring days illuminate grimey windows, cobwebs and dust that’s built up over the winter, homeowners head to the store to stock up on cleaning supplies. Bleach, degreaser, that blue window cleaner — those are the old standbys. But a growing group of people are steering away from these chemical-filled products in favor of natural, eco-friendly alternatives, some of which can be found right in the baking aisle of your local grocery store. “You have to really want to do it and find the alternatives, but the alternatives are out there,” said Joe Walsh, owner of Green Clean Maine, a cleaning service that is currently using natural, homemade cleaning products in more than 450 homes in the Portland, Maine, area. “Once you figure out how to do it, it’s actually just as easy as cleaning with harsh chemicals. In fact, I think it’s easier,” Walsh said. 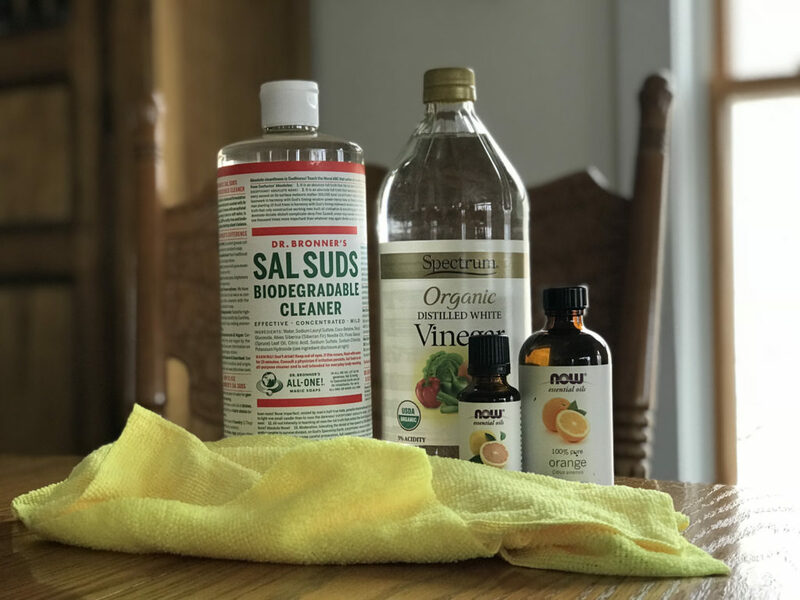 Gentle ingredients such as baking soda, white vinegar, essential oils and natural soaps can be used to create effective cleaning solutions, he said, if mixed properly and used on the right surfaces. Walsh isn’t alone in his belief in green cleaning methods. Serving the midcoast, OrganiClean is a family run cleaning business that only uses non-toxic, homemade cleaning products. Many mainstream cleaning supplies — including chlorine bleach, oven cleaners and upholstery cleaners — release dangerous chemicals that can contribute to chronic respiratory problems, allergic reactions, headaches and even cancer, according to an online article by the American Lung Association. At first, it was difficult for Thibodeau to give up some of her go-to cleaners, but after experimenting with various natural ingredients, she came up with solutions that worked just as well. And assuming she wasn’t the only person seeking alternative ways to clean, she started up a small cleaning business. But in recent years, Thibodeau and Walsh have found that more and more people are seeking their services. Both green cleaning businesses are thriving. Green cleaning is one of those topics that can lead you down a rabbit hole on the internet. There’s a lot of information out there, and not all of it is helpful. In fact, some of it can get you into a bit of a mess. To clean windows, try using just warm water and a microfiber cloth such as E-cloth, a product Thibodeau swears by for cleaning glass. And for especially dirty windows, use a mix of warm water with a little bit of biodegradable soap and white vinegar with a sponge or rag, then finish it with water and the microfiber cloth. To remove stains in kitchen sinks, bathtubs and showers, sprinkle baking soda on a damp sponge and scrub the surface in circular motions, adding just enough water to form a paste the consistency of toothpaste, Walsh said. “That takes off 90 percent of the stains we encounter … it acts like a very gentle scouring agent and it won’t scratch the surface,” Walsh said. Wrap a rag around wooden skewers to create a tool for cleaning corners and crevasses, such as the tracks on a window frame, Thibodeau said. If you have hard water that creates orange stains on your toilet, scrubbing with a pumice stone can remove those stains in a matter of seconds, Thibodeau said. Thibodeau tinkered with ingredients for a while before coming up with her own all-purpose cleaner, which she has used in dozens of homes, and she was happy to share the recipe with our readers. Also need: 32-ounce glass bottle (because essential oils can eat away at plastic bottles over time) and a plastic spray bottle top that fits the top of the bottle. The 32-ounce Bragg Organic Apple Cider Vinegar bottle is perfect for this. Combine all ingredients in the glass bottle. Mix together well. Screw on the spray bottle top and shake before use. Do not use this product on granite, tile or other surfaces that can be eroded by acidic formulas. For those surfaces, simply use a little soapy warm water. If you’d prefer another scent to citrus, try different essential oils in this recipe. Walsh uses lemongrass, tea tree and peppermint oils in his cleaning solutions on a regular basis. And all-natural cleaning solutions made by Good Natured Brand, a southern Maine company, include lavender oil and lemon peel oil.